Enjoy a special selection of fruity and tangy citrus sweets in a pretty candy box to keep and reuse. 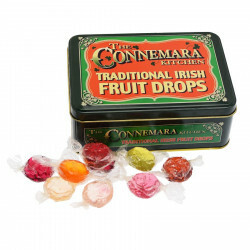 The Connemara Kitchen offers a selection of delicious Irish candies in their brightly coloured vintage tin box. Enjoy a special selection of fruity and tangy citrus sweets in a pretty candy box to keep and reuse. Individually wrapped candies packaged in a plastic bag. Each box contains approximately 15 candies. Discover the new The Connemara Kitchen candy boxes, inspired from Ireland just for you! The Connemara Kitchen is today recognized in the Irish confectionery business. Created by an Irish designer, these beautiful green tin boxes with vintage reliefs are typically inspired from Irish tradition. Ingredients: sugar, glucose syrup, citric acid, flavourings, colourings: E162, E133, E102, E153, E129, E132, E102, E110, E171.